Unlike an HVLP, the LVLP spray gun is operated at a lesser CFM with a small compressor. Trying to find this special type of spray gun can be challenging if you aren’t sure what you are looking for. 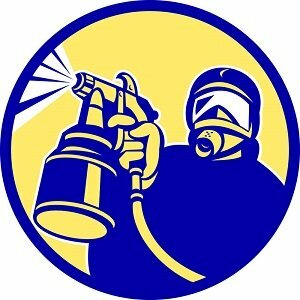 The first step is to understand what the LVLP spray gun uses are. Then, you need to figure out what features are important. Finally, you are going to want the best LVLP spray gun on the market. Here is a quick table of recommended LVLP models. More detailed reviews are below. Let’s take a look at these points in detail so you can get exactly what you need. This special spray gun uses a lower volume of air than the HVLP spray gun. Because there is less volume, the LVLP gun uses less CFM and can be operated with a small compressor. In fact, it is used at 3-4 CFM. It excels at painting small patterns or working on tiny detail. You’ll find these guns used in auto and furniture painting. They are generally equipped with a sharp fluid tip and stainless steel needle. Ideal for using with water-based products, the job you are doing will come out cleaner and the paint is sure to look sharper. Using an LVLP spray gun will lower your costs in comparison to a conventional spray gun. LVLP guns have some flaws to them as with all products. They are non-bleeder guns and will not continuously release air. The concern is that it can make the drying harder and longer. In addition, the nozzle cap and needle on an LVLP gun are smaller. They can be cumbersome to change or remove. You also don’t want to use an LVLP gun when you are attempting to spray a large area as it could take awhile. When looking through the different options of guns on the market, there are several ways to find the right model for you. First, you need to understand that the majority of these guns are based on the same design. If you are using a particular product in your gun, that is where you’ll need to make some decisions about what will work best for you. Determine ahead of time which pattern will work best for you as they all offer different sizes. Which products are you going to be spraying? What type of needle and size are you going to need? What will be the best fan pattern size for your project? The LVLP version of spray guns isn’t as widely used, so finding the best LVLP spray gun can sometimes be tricky. Follow my guide below into the top guns on the market. This one-piece and lightweight aluminum gun feature a 13.5oz/0.4l aluminum cup. There are separate adjustments for fluid, fan pattern and air controls for a perfect application every time. This gun has an air consumption of 4.2 to 6.0 CFM at 30 PSI. The working pressure is 44 to 58 PSI with the maximum pressure of 60 PSI. It also offers a fan pattern of 5.5-inches to 7.5-inches. Use this gun for your automotive, industrial, woodworking or marine projects. The aluminum swivel cup will allow you to rotate the gun to reach those hard to spray places. The stainless steel fluid needle and nozzle are both corrosion resistant. Use the customized controls to make precise patterns and reduce waste. Only offers 2-inches of different fan patterns. This LVLP Gravity Feed Spray Gun Kit is ideal for many applications like marine, industrial, automotive or woodworking. Because it uses less air, you can hook this into a small air compressor. It reduces overspray and allows you to spray for longer periods of time without stopping. You have more control with less overspray and waste with this unit. It also comes complete with a 20oz/0.6l plastic cup. In addition, the stainless steel fluid needle and nozzle are corrosion resistant. Air consumption with this gun is 3.5 to 3.9 CFM at 30 PSI. The working pressure is 28 to 45 PSI with the maximum pressure of 60 PSI. This kit comes with an SP-33000 Spray Gun, 1.3, 1.5 and 1.7mm tips, air regulator, cleaning kit and plastic storage cassette. This is also a great option for the marine, automotive, industrial or woodworking field. With a reduction in overspray, you can complete larger surfaces without the need to stop. Complete with stainless steel fluid needles and nozzles, you get the benefit of corrosion resistance. Use the separate and fully adjustable fluid fan pattern and air controls for precise application. The lightweight SP-33500 aluminum gun body comes with a 120cc plastic cup. The lightweight SP-33000 aluminum gun body comes with a 20oz/0.6l plastic cup. Between the two guns, you’ll have what you need to tackle any project. Air consumption with this gun is 2.4 to 3.9 CFM at 30 PSI. The working pressure is 28 to 45 PSI with the maximum pressure of 60 PSI. You can also achieve a fan pattern of 4-inches to 10.9-inches. This model features a 1.3 nozzle that is equipped with a forged body for a longer life. It is also anodized for maximum corrosion protection. The internal workings of the gun are coated for durability and the needle and fluid tips are stainless steel. With the slick finish, you’ll have it cleaned up in no time when the project is done. Besides that, the advanced, “Air Curtain” design will minimize overspray and pollution. It comes compatible with most traditional and disposable cup systems. The soft trigger reduces finger fatigue and the lubricated adjustment knobs make for superior control. Among the features of the SP-31000, you will receive a lightweight, aluminum body with a 1000cc aluminum cup. It offers air controls for a perfect application every time. It can also separate and adjust fluid for a precise fan pattern. As with many of the other options, you are receiving a stainless steel fluid needle and nozzle. Both of these are corrosion resistant to offer a longer life. You can use this gun with lacquers, enamels, stains, low-viscosity paints, and urethane. Air consumption with this gun is 3.5 to 3.9 CFM at 30 PSI. The working pressure is 28 to 45 PSI with the maximum pressure of 60 PSI. You can also achieve a fan pattern of 7-inches to 10.9-inches. This gun comes with a 1.5mm tip, extra spanner, brush, and socket. Painting can be messy, but picking the best LVLP spray gun doesn’t need to be. Whether you are planning some industrial, automotive, woodworking or marine painting projects, there is a gun that is right for you. Assess what your needs are and then pick your highly rated gun from our list of the current leaders in 2017.